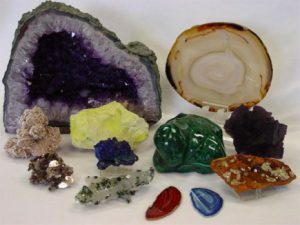 New England Gem and Mineral Show! Save the Date! New England Gem and Mineral Show! Save the Date, Spring 2019! YANKEE MINERAL AND GEM CO.
Club Purpose: The North Shore Rock & Mineral Club was formed in 1958 to stimulate interest in the collection of minerals and to disseminate knowledge of minerology, collecting and classification of materials and their application to the arts so that greater pleasure may be derived from these hobbies. Membership: Annual dues are $10 for an individual and $15 for a family or couple. New members must attend a monthly meeting to join. Monthly Meeting: Club meetings take place the third Friday, September through June at the First Church – Holland Hall, 1 Arbor Street, Wenham at 7:45PM. Pebble Pups, Our “Children’s Group”: Dedicated to the introduction of rocks, minerals, and fossils. During our monthly meeting all children are invited to join Pebble Pups Leader, Tom Rich, for special projects, learning and fun. Field Trip: Club members enjoy many field trips during the spring, summer, and fall months. Day and longer trips (usually occurring on traditional three-day weekends) provide members the ability to collect specimens and directly learn about geology. Mineral Matter: The official newsletter of the North Shore Rock & Mineral Club is published and sent to the membership each month, September through June. To receive a single copy of the newsletter send an email to nsrmc@verizon.net. Annual Show: The Club hosts it’s Annual New England Gem & Mineral Show the first weekend in May at the Topsfield Fairgrounds on Route 1 North, Topsfield, Massachusetts. Affiliations: The club is affiliated with the Eastern Federation of Mineralogical and Lapidary Societies (EFMLS), The American Federation of Mineralogical Societies (AFMS), and The Association of Mass Mineral Clubs. The club abides by the AFMS Code of Ethics. Previous PostPrevious Houston Gem, Mineral, Jewelry, Fossil Show is Nov 9-11!